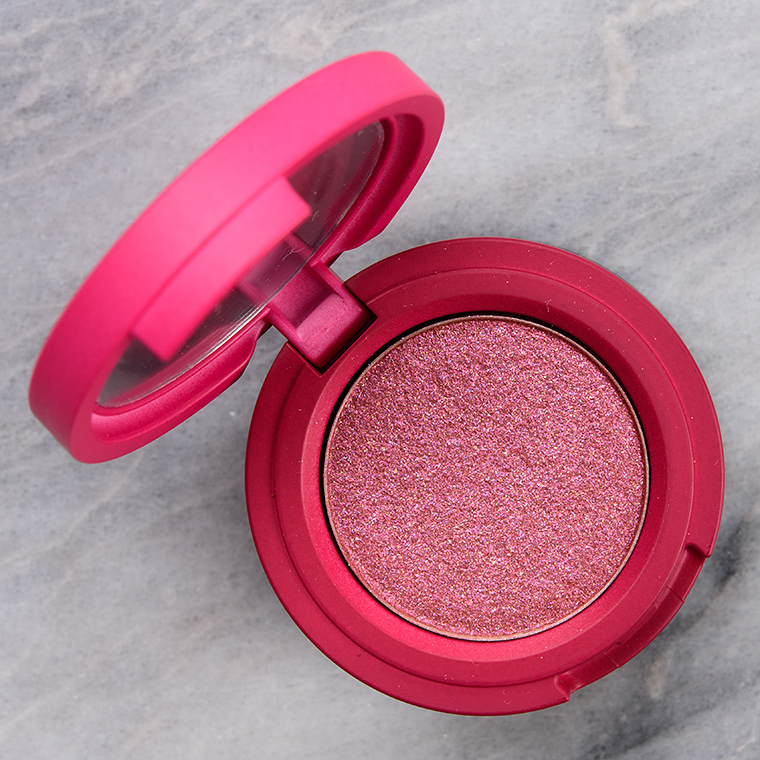 Kaja Sparkling Rose Beauty Bento Bounchy Shimmer Eyeshadow Trio ($21.00 for 0.09 oz.) contains three plummy shades with lightly sparkly finishes. This trio seemed more monochromatic than the other trios, but those who prefer slightly less sparkle may find this one more up their alley compared to the other trios as well. The texture seemed a touch firmer/denser in the first two shades, which made application take a bit more effort. Moscato Pink is a bright, light pink-plum with subtle, warm undertones and flecks of gold and violet sparkle. It had semi-opaque color payoff that was buildable to full coverage with a second layer or if used with a wet brush. The texture was firmer in the pan, which made it a little harder to apply evenly with a brush so using fingertips really was best (as the brand recommended, but I’ve had good experiences using these with a regular brush!) as the warmth helped to maneuver the product across my skin better. The application wasn’t as foolproof as other trios, though. It wore well for eight hours on me, and I didn’t notice any fallout over time. Urban Decay Young Love (PiP, $19.00) is darker, warmer (90% similar). Tom Ford Beauty Violet Argente #2 (Eye Color) (LE, ) is more shimmery, warmer (90% similar). Colour Pop Dream Lover (LE, $5.00) is more shimmery (90% similar). Huda Beauty Fling (Remastered) (PiP, ) is more shimmery, warmer (85% similar). MAC Violet Blend #3 (LE, ) is more shimmery, lighter, brighter (85% similar). Colour Pop Exo (LE, $5.00) is more shimmery, lighter, brighter (85% similar). Colour Pop Patrona (LE, $5.00) is more shimmery, darker, warmer (85% similar). Urban Decay Ego (LE, $19.00) is more shimmery, lighter (85% similar). Anastasia Palermo (LE, $12.00) is darker (85% similar). Ciate Orchid (PiP, ) is more shimmery (85% similar). The formula is supposed to have “uniform shimmer in every swipe” that is best applied “with your fingers.” They have a dimethicone-heavy feel (unsurprising given it was typically the first ingredient in each shade), so there’s a velvety slip that is lightly emollient but not truly wet or cream-like to the touch. I found them to be more powder-like than cream-like, but they had the binding and hold of a creamier formula. They applied well to bare skin without the need of primer, adhesive sprays, or glitter glue for pretty stellar wear–they often lasted between eight and 10 hours on me with slight fallout. I more often saw faint creasing after eight hours than much in the way of fallout. Fingertips will definitely yield the most pigmented the quickest, but I didn’t struggle to use brushes (my preferred method for precision) and found that brushes often packed semi-opaque or opaque coverage as well. I also tried them wet and didn’t find that to cause issues to the pan, and it did give some shades a smoother, shinier finish but wasn’t necessary to use them (more like a bonus). I didn’t have issues with fallout whether I used my fingertips or brushes to apply; I pressed and gently pulled the brush across my lid area to distribute the product (same technique I use for high-shimmer/metallic shades). They were impressive; they were magical–if you love sparkly, shiny eyeshadows, they’re well worth a look! 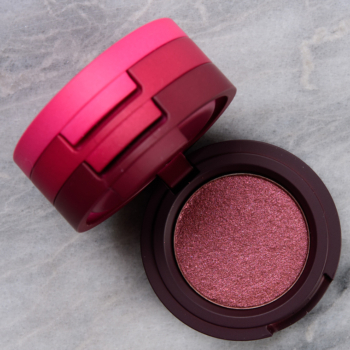 Browse all of our Kaja Bouncy Shimmer Eyeshadow swatches. Dimethicone, Calcium Titanium Borosilicate, Synthetic Fluorphlogopite, Iron Oxides (CI77491), Mica (CI77019), Titanium Dioxide (CI77891), Polymethylsilsesquioxane, Diisostearyl Malate, Hydrogenated Poly(C6-14 Olefin), Phenyl Trimethicone, Calcium Aluminum Borosilicate, Hydrogenated Castor Oil Isostearate, Aluminum Distearate, Peg8 Dimethicone, Sorbitan Sesquiisostearate, Synthetic Wax, Dimethicone/Peg-10/15 Crosspolymer, Phenoxyethanol, Propanediol, Tin Oxide (CI77861), Silica, Dipropylene Glycol, Sodium Citrate, Tocopherol. Cassis is a soft, reddened plum with warm undertones and a sparkling finish. It had semi-opaque, buildable pigmentation, which was the same whether I applied with fingertips or a dense, dry brush. The texture was smooth to the touch but felt thinner and a bit more firmly-pressed in the pan compared to other shades in the same formula. The eyeshadow applied evenly and didn’t have fallout during application, and there was only a touch of fallout over the eight hours it lasted well for. Tom Ford Beauty Violet Argente #2 (Eye Color) (LE, ) is less shimmery, darker, cooler (90% similar). 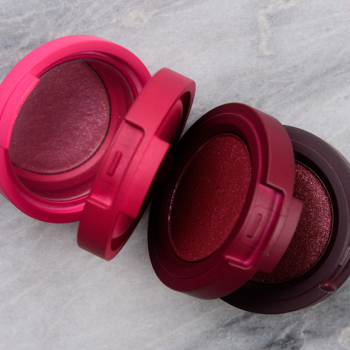 Urban Decay Young Love (PiP, $19.00) is less shimmery, darker, cooler (90% similar). Urban Decay Ego (LE, $19.00) is less shimmery, darker, cooler (85% similar). Makeup Geek Anarchy (P, $6.00) is less shimmery, darker (85% similar). Sephora Camellia (PiP, ) is less shimmery, darker (85% similar). Huda Beauty Fling (Remastered) (PiP, ) is less shimmery, darker (85% similar). Too Faced Berried Treasure (PiP, $16.00) is less shimmery, darker (85% similar). Colour Pop Patrona (LE, $5.00) is less shimmery, darker, cooler (85% similar). Colour Pop Dream Lover (LE, $5.00) is less shimmery, darker, cooler (85% similar). Sephora Rosewood (LE, ) is less shimmery, darker (85% similar). Dimethicone, Iron Oxides (CI77491), Calcium Titanium Borosilicate, Mica (CI77019), Synthetic Fluorphlogopite, Polymethylsilsesquioxane, Diisostearyl Malate, Hydrogenated Poly (C6-14 Olefin), Titanium Dioxide (CI77891), Phenyl Trimethicone, Calcium Sodium Borosilicate, Hydrogenated Castor Oil Isostearate, Aluminum Distearate, Peg-8 Dimethicone, Sorbitan Sesquiisostearate, Synthetic Wax, Dimethicone/Peg-10/15 Crosspolymer, Carmine (CI75470), Phenoxyethanol, Propanediol, Tin Oxide (CI77861), Silica, Dipropylene Glycol, Sodium Citrate, Tocopherol. Cognac is a medium-dark plum with strong, warm undertones and a pearly sheen. There were very faint sparkles strewn throughout, but it wasn’t as sparkly as most of the shades have been in the trios. The texture was smooth, lightly creamy, and dense without being stiff or too firmly packed in the pan. It had opaque color coverage in a single layer whether I applied with fingertips or a dry brush. It applied evenly, blended out easily, and stayed on well for eight hours on me. Guerlain Electric Look #7 (LE, ) is more shimmery (95% similar). Tom Ford Beauty Pink Glow #3 (LE, ) is more shimmery (90% similar). Colour Pop Once and Floral (P, $8.00) is more shimmery, darker, cooler (90% similar). Kat Von D Stupid Autocorrect (LE, ) is more shimmery, lighter (90% similar). 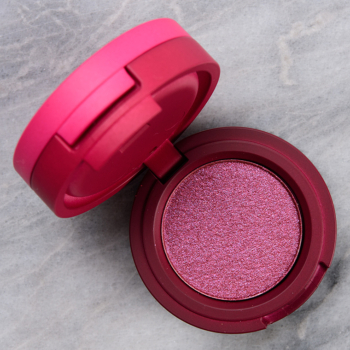 Too Faced Berried Treasure (PiP, $16.00) is more shimmery (90% similar). KKW Beauty Cherry (PiP, ) is more shimmery, darker, warmer (90% similar). Too Faced Temper Temper (LE, $16.00) is more shimmery, darker, cooler (90% similar). Sephora Camellia (PiP, ) is more shimmery, lighter (90% similar). Huda Beauty Ruby #5 (LE, ) is more shimmery, cooler (90% similar). Too Faced Hot Toddy (LE, $16.00) is more shimmery (90% similar). Dimethicone, Synthetic Fluorphlogopite, Iron Oxides (CI77491), Calcium Titanium Borosilicate, Mica (CI77019), Iron Oxides (CI77499), Polymethylsilsesquioxane, Diisostearyl Malate, Hydrogenated Poly(C6-14 Olefin), Phenyl Trimethicone, Titanium Dioxide (CI77891), Hydrogenated Castor Oil Isostearate, Aluminum Distearate, Peg-8 Dimethicone, Sorbitan Sesquiisostearate, Synthetic Wax, Dimethicone/Peg-10/15 Crosspolymer, Phenoxyethanol, Propanediol, Carmine (CI75470), Iron Oxides (CI77492), Ultramarines (CI77007), Tin Oxide (CI77861), Silica, Dipropylene Glycol, Sodium Citrate, Tocopherol. Kaja Beauty Bento Bouncy Shimmer Eyeshadow Trio $21.00/0.09 OZ.